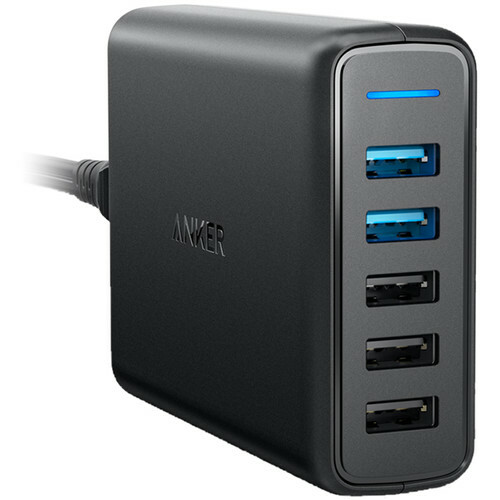 Keep your mobile devices and power banks fully charged with the PowerPort Speed 5 5-Port USB Charger from Anker. Two of the five ports on the PowerPort Speed 5 are compatible with Qualcomm Quick Charge 3.0 technology. Each QC 3.0 port can output a maximum of 3A of power. The remaining three ports share a total output of 4.8A, with a single port capable of recharging a device with up to 2.4A of power. All five ports support Anker's PowerIQ and VoltageBoost technologies, which are designed to charge your devices as fast and safely as possible. Thanks to dual-voltage support, this charger can power your smartphones, tablets, and other devices both at home and abroad. Anker also includes multiple safety features to help make sure that your devices are protected while charging. Anker's PowerIQ technology is designed to intelligently communicate with connected devices to determine their specific charging capabilities, and then provide them with the fastest charge possible. Anker's VoltageBoost technology is engineered to compensate for your cable's resistance in order to smooth the voltage output of the charger. Without this interference, your devices have the ability to reach the fastest recharge rate possible. Anker includes a MultiPoint safety system to help keep your mobile devices protected while charging. The system includes surge protection, short circuit protection , and temperature control. A durable matte exterior is designed to resist scuffs and scratches, while the high-gloss detailing and cool blue power LED give the charger a sleek look. Box Dimensions (LxWxH) 7.9 x 5.2 x 2.0"
The ANKER PowerPort Speed 5 5-Port USB Charger B&amp;H # ANA2054J11 comes with a 5 ft. power cable.